Broadcom offers internships and co-ops to a wide range of individuals from diverse majors, degrees, backgrounds, and previous experiences. Interns work directly with professionals who are willing to share their experience and provide mentorship to them over the course of their internship. Broadcom offers full-time paid internships (40+) and provides a formalized internship training program that exposes interns to company practices and teaches them the skills necessary to meet the internship requirements. 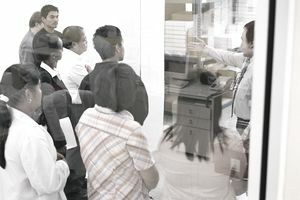 As part of the program, Broadcom works through a University Recruiting Department that assists the business units and departments with the formalized training offered to interns. All interns at Broadcom must be currently pursuing a Bachelor’s, Master’s, or Ph.D. from an accredited University or College. The length of each internship assignment may vary and can be extended or shortened based on the needs of the company. Interns can use the work experience they gain by working at Broadcom to receive real-world, practical knowledge to complement what they’ve already learned in the classroom. Generally, interns work 20 hours per week while college is in session and 40 hours per week over the course of the summer. Those students who are part of the Co-Op program are also currently pursuing a Bachelor's, Master's, or Ph.D. at an accredited University or College. Students participating in a Co-Op experience are required to apply the knowledge learned in the classroom and bring those skills to the real-world as they gain hands-on experience working in professional business culture. Co-Op students usually work full-time (40 hours per week) for a 4, 8, or 12-month duration. Co-Op assignments generally alternate between academic terms and continue until the student completes the program. Broadcom offers careers in telecommunications and high tech jobs. Broadcom is considered one of the leading semiconductor companies in the world. Many of the talented employees working at Broadcom design and develop a wide range of products targeted to the most impressive broadband communications markets in the global marketplace. Broadcom seeks talented entry-level and mid-level career professionals to apply for job openings on their website. Broadcom offers employment and great benefits to some of the most high-level engineering and business professionals around. When applying for internships, be sure to check out Five Easy Ways to Improve Your Cover Letter and The 5 Ways to Improve a Resume prior to sending in your documents. By following these steps, you will be well on your way to getting yourself noticed by employers in hopes of getting called for an interview. The sole purpose of a resume and cover letter is to land an interview, so the effort it takes to improve your documents is well worth the effort.